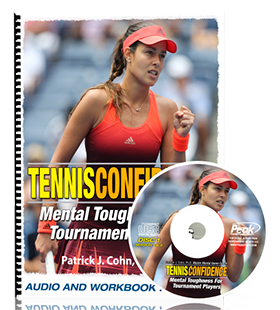 How well does your tennis mental toughness hold up during critical points during matches? 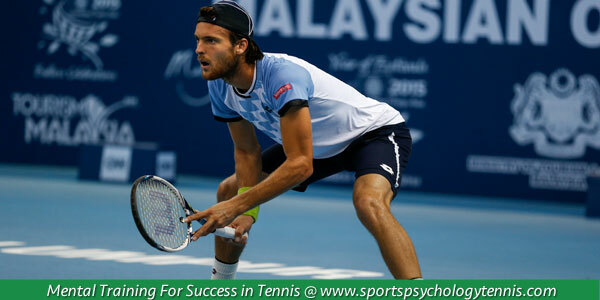 During a close match when you need to win an important point, your mental game can determine your success or failure. If you tighten up, worry about losing the game, or attempt to be over aggressive with your shots, you sabotage your chances of winning the point and the match. A few top players, such as Andre Agassi, raise the level of their game during critical times in the match. They are called gamers—they can hold serve or break when they need to most because of their focus and determination. 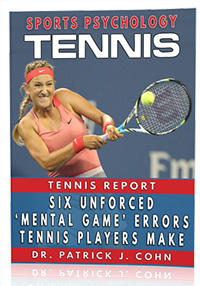 Other players, who struggle with the mental game, under perform during critical points in a match. They are overcome with tension, doubt, hesitation, or just plain choke. Most of the time, you won’t under perform during critical points because of a loss of focus unless you become frustrated with your play or get ahead of yourself. My philosophy is that most players can concentrate well, but their focus can be “lost” due to other mental game challenges such as a lose of composure after missing an easy shot. I’m not sure it’s trying too hard in this case, because trying too hard leads to tension in your strokes—it’s almost the same affect as being anxious. When you are trying too hard, you attempt to hit the perfect shot or serve – a cross court winner – and it backfires on you because of that little extra tension in your stroke and thus a lack of tennis mental toughness. Another way that you may lose critical points during the match is being overly precise with your shots. When you try to place your shots instead of trust your body to hit your target, your mind gets in the way because you over control your strokes. Another option is you change your strategy and start to protect your position in the set. If you get a 5-4 lead in the first set, for example, some players get too defensive with their strategy. You sit on your lead, play safe shots, and hope your opponent makes the first mistake. What are some solutions to help you play with more mental toughness at critical times in the match? First, treat each point with the same focus and intensity. Don’t think of a critical point as a “have to” situation. You’ll put too much pressure on yourself and this will lead to trying too hard or being too protective. Second, you must continue to play aggressive and trust your shots. In other words, you don’t want to play cautiously and hold back. I see this problem with junior tennis players a lot when they get a big lead in the set. If you play too cautious with a lead, you’ll probably let your opponent back into the set. Third, stay focused on executing the current point. Whenever you focus on results – after the current point – you get too far ahead of yourself. Most of the anxiety and tension that looks like choking comes from thinking too far ahead of the current point.